Nearly two-thirds of people in the Washington area believe the primary role of speed and red-light cameras is to create cash for local governments -- not to make roads safer. 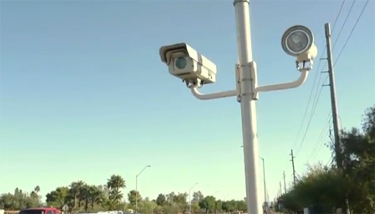 WASHINGTON – Nearly two-thirds of people in the Washington area believe the primary role of speed and red-light cameras is to create cash for local governments — not to make roads safer. The poll, conducted by Heart+Mind Strategies, also finds the most frustrating thing for commuters is traffic congestion. Twenty-seven percent cite it as the biggest frustration, followed by the amount of time wasted in traffic (19 percent). Fourteen percent say other drivers are the most frustrating, while 10 percent cite the cost of commuting. Construction delays come in at 8 percent and public transportation times rounds out the list at 5 percent. Four in 10 (42 percent) say their round-trip commute takes more than an hour each day, with many on the road much longer. Ten percent have commutes of 90 minutes to two hours. Another 11 percent travel more than two hours. Some in the region have short commutes. Thirty percent say their total commute time is less than 30 minutes, and 12 percent say it’s less than 15 minutes. D.C. residents tend to have the shortest commutes, while Virginians tend to have the longest, with Maryland in the middle. The poll has a margin of error of plus or minus 4.2 percent. The D.C. metro phone survey was conducted among 550 adults age 18 and over, between May 11-18, 2012. This included representative samples of 200 people in Virginia, 250 in Maryland and 100 in the District. Heart+Mind Strategies is a non-partisan market research consultancy based in Reston, Va.
WTOP’s Mitchell Miller contributed to this story. Follow Mitchell and WTOP on Twitter.